Led by Vista Studio artist and teacher Heidi Darr-Hope, Creating Brave is an online community and eCourse hub for healing, growing, and thriving through mindful art practices. Creating Brave wants to cultivate creativity for all! 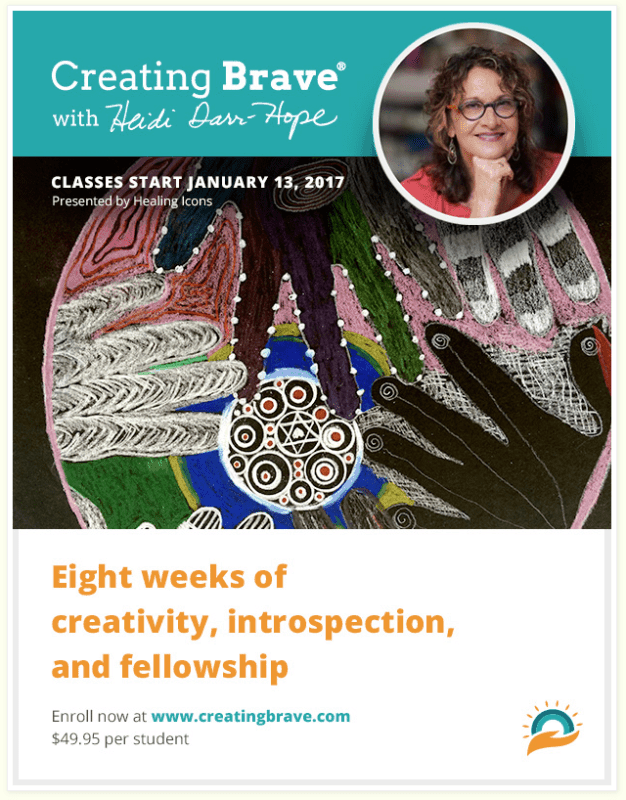 Healing Icons is presenting Creating Brave’s eight-week eCourse, Mindful Mandalas. This exciting new offering taps into each individual’s potential for creative expression through the ancient art of mandala-making. Enroll Today. Limited-time, special introductory price of $49.95 (reg. $99.99). A Creating Brave eCourse is the perfect gift for any occasion. More than an art class, Creating Brave offers your loved one the joy of discovering their own unique creativity; a chance to meet others in a warm, enthusiastic, and supportive community; and the catharsis needed to overcome life’s challenges and disruptions. Instead of a material gift, give the gift of experience — the chance to learn something new and make lasting memories. Mandalas are ancient, archetypal symbols of balance, wholeness and unity. Creating Brave has adapted this practice for our time and needs to help students reduce stress, uncover valuable insight, improve communication and connections with others, build self-confidence, and promote health and well-being. Creating Brave invites you to take advantage of our time-tested art-as-healing techniques in the comfort of your own space and at your own pace. Courses can be given as gifts for occasions, such as birthdays and anniversaries, or “just because.” Groups are welcome to join and arrange times to complete the coursework together, but each group member must enroll individually. Each lesson in the eight-week eCourse features beautiful, easy-to-follow video tutorials, assignments to practice the techniques you’ll learn, prompts for further reflection in your art journal, and opportunities to share your creations and respond to others’ artwork. We believe that every person has innate creativity. Creating Brave aims to help each student discover their creative potential while reducing stress and fostering a thriving, supportive, and engaged community. What are you waiting for. Take the risk and jump in.